Is Starting a Team the Right Solution for Your Business? 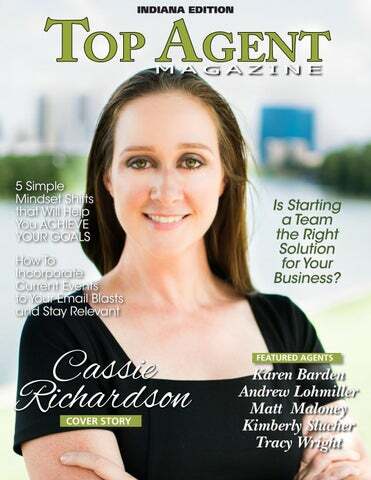 BARDEN MATT MALONEY on beingKAREN featured for the stateCASSIE RICHARDSON Matt TRACY Maloney WRIGHT of Indiana in Top Agent Magazine! For more information about Karen Barden, please call 574 - 933 - 3410, email karenlbarden@gmail.com, or visit karenkares.com www. 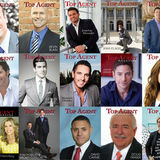 on being featured for the state of Indiana in Top Agent Magazine! LYNN E. ERICKSON, PRESIDENT MCKESSON TITLE CORP. Under the banner of Pursuit Realty, Cassie Richardson spearheads her work solo and serves clients of all kinds across the greater Indianapolis and southern Indiana region. she enjoys quality time spent with family and loved ones, cheering on their favorite local sports teams, and enjoying the great outdoors. Considering the future of her career, Cassie intends to continue on her steady path, with plans for future growth and added responsibilities within her brokerage. For now, she is content to lend her expertise in guiding the aspiring buyers and sellers of her community, one home at a time. in business, million dollar deals are not intimidating. So I think my clients feel comfortable with me representing them at the negotiating table.” Precise, savvy marketing also figures into Matt’s success story. “My marketing strategy is very targeted, in terms of doing analysis of where buyers are coming from, and hitting ads for certain houses in those areas. I don’t just throw an ad out there. My marketing strategy has evolved into something that’s really working, and I think it’s very unique,” says Matt. Print ads, professional photography and videos are also tools in his marketing arsenal that are employed to great effect. For Matt, the real estate business transcends the transactional, and what he enjoys most is the relationships he is able to build with his clients. “I love becoming a part of my client’s lives,” he says. “I have clients who recently asked me to come to their new home so I could see what they’ve done with the place,” he says, “and I feel like we’ve become great friends.” Matt is also deeply committed to giving back to his community. Formerly a coach of his son’s baseball and basketball teams, he is also a former President of the Munster High School Booster Club. In addition, he currently sits on the Board of Directors for the South Shore Convention and Visitors Authority, a group that focuses on bringing tourism to and touting the benefits of Northwest Indiana. Matt is also a member of his local Chamber of Commerce. Looking to the future, Matt’s plan is to continue growing his business, first adding an administrative assistant, and then forming a team of newer agents he looks forward to mentoring. Above all, however, his foremost objective is to continue offering the incredible customer service that has become his calling card. “I have a passion for helping those who choose to live here feel right at home,” he says. To learn more about Andrew Lohmiller email ALohmiller@LohmillerRealEstate.com, https://www.facebook.com/lohmillerrealestate/ visit LohmillerRealEstate.com, call (812) 584 – 6880, or visit his Facebook page here. www. For more information about Tracy Wright, call 317 - 281 - 0347 or email tracy.wright@encoresothebysrealty.com, visit tracywright.net www.